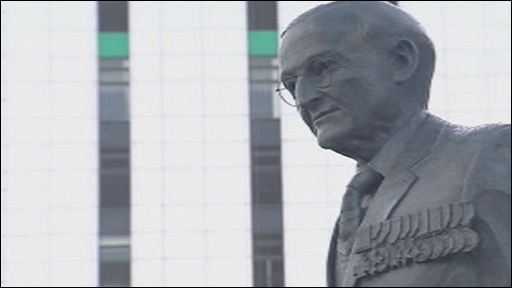 A statue honouring the late Victoria Cross holder and former Welsh Rugby Union president Sir Tasker Watkins has been unveiled by his daughter. The 9ft (2.7m) bronze sculpture takes pride of place on the walkway leading into the Millennium Stadium in Cardiff. Lady Mair Griffith-Williams performed the ceremony in front of a distinguished audience. Sir Tasker, whose wartime bravery earned him the Victoria Cross at the age of 25 in 1944, died two years ago. The ceremony followed a march from Cardiff Castle by 2nd battalion, the Royal Welsh Regiment, and the Royal Welsh band. Among those there were First Minister Rhodri Morgan, Lord Chief Justice Lord Judge, Welsh assembly Presiding Officer Dafydd Elis Thomas, The Archbishop of Wales and Major General R J M Porter. Mr Morgan called him "a unique individual" and "truly one of the outstanding Welshmen of the 20th century". Lady Griffith-Williams said: "I am very proud that my father has been commemorated by this wonderful statue and particularly pleased it is here at the Millennium Stadium. "The family is extremely grateful to everyone who has made this possible." The campaign to create it was led by the current WRU president Dennis Gethin, along with food entrepreneur Stan Thomas Sr and his businessman son Sir Stanley Thomas. 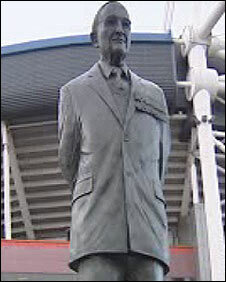 The Welsh Assembly Government and Cardiff council both contributed towards the £100,000 statue in honour of Sir Tasker, who died aged 88 in September 2007. 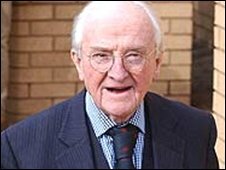 Sir Tasker, who was born in Nelson, Caerphilly, became an eminent judge, and was knighted in 1971. He also became deputy lord chief justice of England and Wales, and was president of the WRU from 1993 to 2004. Mr Gethin said: "This statue is a fitting tribute to a Welshman who achieved such distinction through his involvement in the military, the law and rugby. "His endeavours displayed astonishing courage, a remarkable intellect, profound wisdom and a sense of honour which earned him the respect of all who met him." It is the work of the Llantwit Major-based artist Roger Andrews, who called it "by far the most thrilling project I have ever been involved in". Mr Andrews said: "If I never completed another work I am certain this is the one sculpture I passionately wanted to create. "In order to achieve a true likeness of the man I have spoken to many of his friends and family because I wanted to capture his character as well as his physical likeness."